On 28 January 2016, the first workshop of this year’s edition of ADAMED SmartUP Academy was held. 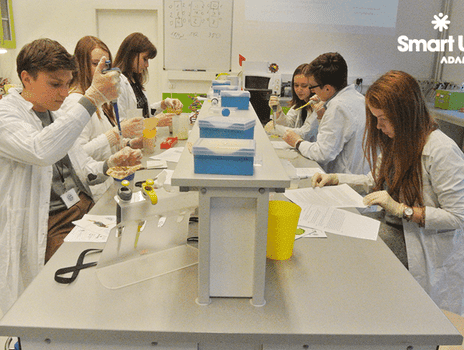 During it, young participants learnt how to work with proteins, how the knowledge on proteins is used in biotechnology, and what proteomics deals with. The workshop consisted of two parts: practical and theoretical. During the first block of classes, the participants were acquainted with the laboratory equipment and conducted experiments. Under the instructors’ supervision, they isolated proteins from various tissues and specimens such as: fish muscles, basil leaves, cow and soya milk and hen egg white and yolk. Next, they determined the amount of proteins in the test samples with the use of Bradford colorimetric method, which gave attractively coloured samples, and after that they divided the proteins according to their size using a special gel. The practical classes were accompanied by a lecture. The instructors elaborated on the previously applied methods of protein isolation, biotechnology and proteomics. The participants jointly sought answers to the questions: Is milk casein larger than egg ovalbumin? What is the difference between cow and soya milk? What do myosin and actin of a muscle look like? Additionally, they pondered the question if DNA testing is enough to learn the secrets of a human body.